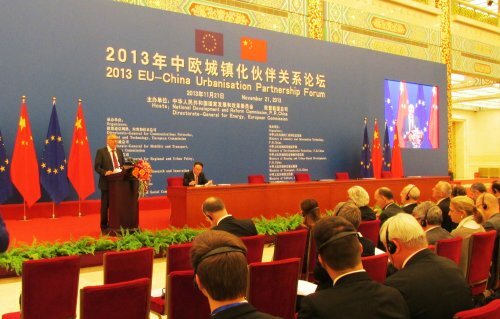 Within the framework of the Strategic Partnership on urbanisation between the European Union and the Chinese Government, 2013 EU-China Urbanisation Partnership Forum was held in Beijing on November 21 in which five sub-forums were organised in the morning. One of these entitled « Cultural City » and was devoted to the role of culture in a city and the preservation of the ancient heritage. A delegation of the China-Europa Forum (CEF) was invited to attend the sub-forum. At the plenary session held in the afternoon in the Great Hall of People, a summary of these sub-forums was presented and followed by the speeches of Chinese Premier LI Keqiang, President Herman Van Rompuy of the European Council, and President José Manuel Barroso of the European Commission. Pierre Calame, President of the CEF Foundation chaired in the morning the closing session of the “Cultural City” sub-forum and presented the summary report entitled “Preservation of Heritage, Culture and Development : Same Words, Different Approaches” at the main Forum in the afternoon. Meanwhile, he took the opportunity to share with more than 800 Chinese and European participants the results of the EU-China Urbanisation Partnership-Guangzhou Forum which was held on November 16-19. “It is a great honour for the China-Europa Forum to have the floor in this solemn palace. This honour symbolises the need to recognise the role of civilian society in the dialogue between societies…. this type of open and in-depth dialogue must be able to support the EU-China strategic partnership on urbanisation,” said Mr Calame. Even if all speakers agreed on the importance of culture, Mr Calame noticed different approaches regarding the actual role of culture and its relationship with development, and identified some key issues that have been found over the presentations and discussions. (1) Is culture a resource for the transition to sustainable cities and societies ? Do we want to mobilise the cultural resources of society for serving this transition ? Or do we consider only historical heritage as a conservatory of the past ? (2) Culture and development : Is there a balance between the two or do we need to invent an integrated approach ? Does that mean finding a “better balance” between heritage preservation and economic development, in which these are treated as two different objectives, and the balance of not sacrificing one for the other ; or, to the contrary, do we consider the need to invent new approaches where the past and the future are associating, and culture and development are mutually reinforcing ? If we prefer the second approach, the presentations showed that we need a greater capacity and to be able to manage complexity governance involving all stakeholders to move from planning to strategy. (3) Do we design heritage preservation as a « museum without walls », the conservatory of a past which has nothing to say about the future, or as a store of wealth whether it concerns lifestyles or relationships between society and nature ? One of the speakers offered the parallel example between our relationship with the heritage of the cities and the relationship of a grandson with his grandfather : Is it a matter of laying flowers on his grave or of learning from his wisdom ? (4) Do we consider culture as static data or as a dynamic reality ? If we have a static definition for culture we observe that “modern” culture has succeeded the preceding one that was not “modern” and we want only to keep some memories of this in a box. Instead, if we consider culture as a dynamic reality, constantly changing, then we are looking for continuity between the old town and the modern city, and we want to give new uses to the entirety of urban heritage. (5) Is cultural wealth an essential element for the transformation of our world ? If culture is only for the beautifying of our world, a leisure activity among others, so it can be locked in houses dedicated to art activities or museums. If we consider instead cultural wealth as a key resource in a society of creation and knowledge, cultural development comes to nourish the entire development, including economic. And in this perspective, it is the whole city that contributes to education. (6) The preservation of architectural, urban and cultural heritage is part of our responsibility for passing on the message of past generations to future generations as well as our responsibility to provide them with a liveable world.